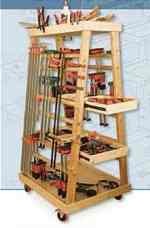 Convenient, mobile organizer for all your clamps and supplies. Keeping your wide assortment of clamps in one place and near your assembly table or workbench is like herding cats. You may find your spring clamps in one corner of the shop, hand screws in another, your strap clamps in a drawer, and your bar clamps scattered all over. But with this mobile A-frame rack, you can stop the madness and keep everything within arms reach.